This modest but polished film follows an older woman’s journey of self-discovery as her partner is sent to jail. 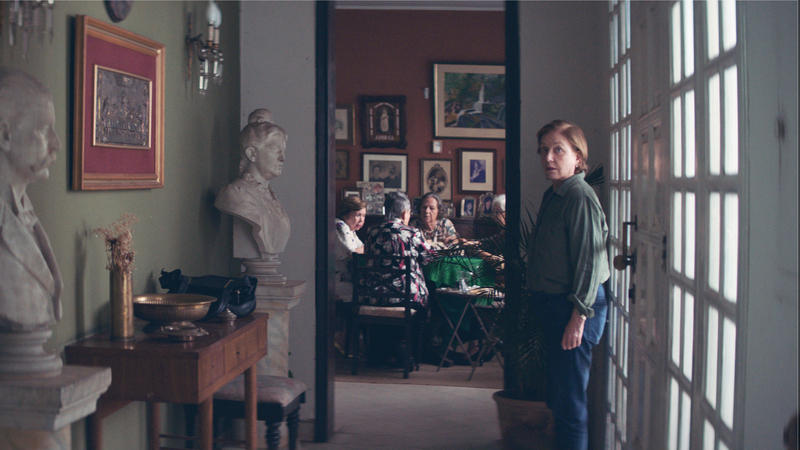 Set in the Paraguayan capital city of Asunción, Marcelo Martinessi’s The Heiresses opens as the vivacious Chiquita (Margarita Irún) finds out she has been sentenced to prison for unpaid debts. No more information than this is given on her financial history, or indeed her past in general. But while Chiquita is relatively relaxed about the whole ordeal, her more introverted partner Chela (Ana Brun) is fearful for the previously well-to-do couple’s reputation and morose about having to selling her inherited antique furniture and hire a cheaper maid. Things begin to change following a chance encounter with an elderly neighbour (María Martins) leading to Chela – despite no longer having a driving license – becoming the de facto chauffeur for a flock of bridge-playing retirees. Through this side job she then happens to meet the young and sensual Angy (Ana Ivanova) who hangs out with her friends at the bridge club. The internal fireworks Angy instantly sets off within her are clear to see, as Martinessi’s frequent close-ups of Chela’s face make her emotional ups and downs the driving force of The Heiresses. The spark of Chela’s attraction to Angy is fanned into full flame when the latter asks for a weekly lift to her mother’s hospital appointments in a distant province. Despite never having driven on a motorway, Chela seizes the opportunity to get closer to her crush; meanwhile her visits to Chiquita in prison and interest in her legal case dwindle. The tragedy of the film revolves around Chela’s mistaking Angy’s friendliness and generally sexual nature for reciprocal attraction, despite her obvious heterosexuality, which Martinessi plays with masterfully to manipulate with his audience’s expectations. Chela’s delusions about her desirability and prospects with Angy mirror the crumbling yet beautiful colonial era mansion she inherited and still lives in. And just as Chela is forced to sell her family’s original paintings and neoclassical dining table to adapt to her brutal new financial reality, so must she also come to terms with the fact that Angy sees her as a taxi-driver and quirky conversation buddy, not a prospective sexual partner. While Martinessi expertly tells his story, ultimately The Heiresses lacks the ambition – either aesthetic or narrative – that sets apart all truly great films. Its “coming of age in later life” theme is one that has been seen many times before, including in another recent South American film, Sebastián Lelio’s 2013 Gloria. While Berlin Best Actress winner Brun is fantastic as Chela – as are all the actresses in an almost exclusively female production – there is nonetheless a sense of emotional depths left untapped by a script that never quite takes off.